It’s the last day of school at Lafayette and time for the DiMeo family to send J.J. off to camp in style. In a nice twist, Maya is on her best behavior (even if she’s dying inside about her baby going away for the entire summer), and it is actually J.J. who starts freaking out about camp after his physical therapist talks about having to leave camp early when she was a kid because she missed her family so much. 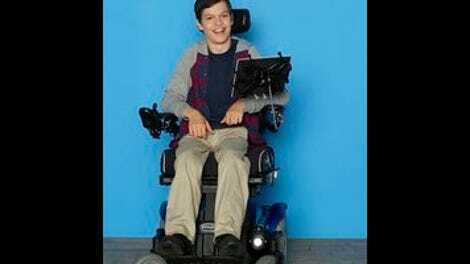 Once again, the Maya-J.J.-Kenneth trio has a really strong storyline to cap off a stellar first season of Speechless. They work so well together on the show because Maya and Kenneth both care deeply about J.J.’s well-being, but often come at it from very different perspectives. But they aren’t the only ones who made J.J.’s storyline great. When Dylan, Jimmy and J.J. came upon the bonfire, the looks on their faces were incredible. It was the most beautiful moment of the entire season for me. I burst into tears, you guys. Like straight up just burst out crying. Wow wow wow, that was so good. I then kind of just kept crying through the end of the episode. “You got this, baby boy.” YOU GUYS. And the J.J. storyline wasn’t the only bright spot, not by a long shot. Jimmy and Dylan got a wonderful B-plot in the form of trying to have a “vacation” now that the money they could have spent on a vacation went to pay for J.J.’s camp. Jimmy does his best to make their Miami layover fun for Dylan, but it’s hard when money is so tight. Once again, it’s Speechless reminding us about the DiMeos’ socio-economic situation without beating us over the head with it. It’s so hard to be a parent when money is tight because all you want to do is make your kids happy and do fun things for them, but fun can’t trump basic needs, and after paying for camp, the DiMeos have to worry about more practical matters—plus, as Dylan says, J.J. deserves this. Now, I would argue all the DiMeos deserve a bit of fun, but I get her point. And last but not least, even Ray had a great plot this week. Not that Speechless hasn’t had episodes where everything is strong, but it’s definitely nice for the show to go out on such strong plotlines. Ray’s been trying all season to get a girl and while he’s adorable in his awkwardness, he can also be a little much, as evidenced by his yearbook signings where several girls basically ask him to stay away from them. Yeah, Ray—you definitely don’t want to cross the line over to creepy. But he finally meets a girl who likes him for him and she has a brother who is attending J.J.’s camp and she lives in Orange County! So Ray is all set. They’re going to be pen pals this summer and pick things up in the fall. It’s super cute and he finally gets his first kiss (that’s his first, right? I can’t remember him actually getting another one this season). So all is right with the Speechless world (renewal!) and if you’ll excuse me, I have to go keep crying over that bonfire moment. Mason Cook has really grown up over the course of the season. It is kind of startling how much older he looks than from the early episodes. Speaking of early episodes, love the callback to the pilot, with Maya racing the kids to school and the cops clocking her with the radar gun. Seriously, we should get summer hiatus webisodes that chronicle Summer Kenneth’s life. I demand to see some jazz brunching.